The output of a T flip-flop alternates between HIGH and LOW with each clock pulse. Toggles are widely used in electronic logic circuits because they can be combined to form counting circuits that count the number of clock pulses received. 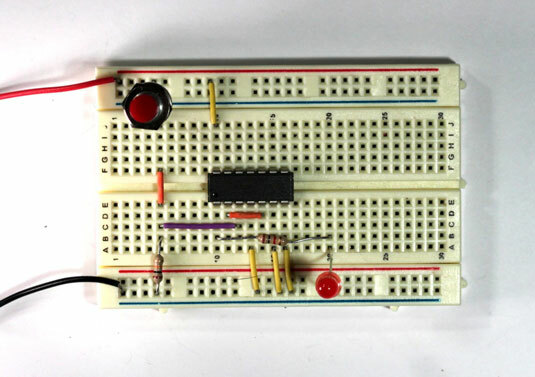 This project shows how to build a T flip-flop in which each press of a button causes an output LED to alternate between on and off. For this project, the Q-bar output from the flip-flop is connected to the DATA input. Then, each time the Clock input goes HIGH, the inverted output from the Q-bar output is fed into the DATA input. This causes the Q output to invert. When you use one of the flip-flops in a 4013 IC, be sure to connect any unused inputs to ground. 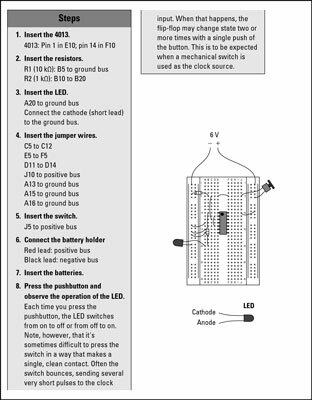 All unused inputs in CMOS logic chips should be connected to ground, but for simple breadboard circuits, the ground connections aren’t usually required. However, the DATA and CLOCK inputs of a 4013 flip-flop won’t work properly if you don’t ground the SET and RESET inputs. Although you can construct your own flip-flop circuits using NAND gates, it’s much easier to use integrated circuits (ICs) that contain flip-flops. 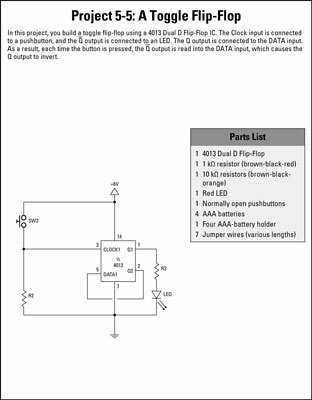 One common example is the 4013 Dual D Flip-Flop. This chip contains two D-type flip-flops in a 14-pin DIP package.